The Wooden Cow Gallery and Art Space | A local creative art space devoted to the joy of art & community. A local creative art space devoted to the joy of art & community. We are currently in the middle of creating a brand new website for The Cow! You can still visit our old site at woodencowgallery.wordpress.com, all information on that site is still current. Thank you for your patience! We promise a shiny, new website soon! Holiday Sale and Art Bazaar! 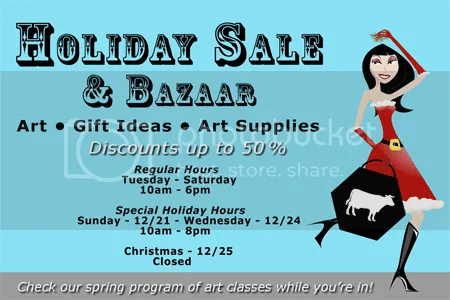 If you live in Albuquerque or are visiting during the holiday season, stop by The Wooden Cow Gallery and Art Space for our Holiday Sale and Art Bazaar. Check out our selection of original artwork by local artists at reduced prices for the holidays. Our Art Bazaar features a selection of significantly discounted artwork, as well as, art and craft supplies for the budding artist. We’re adding new things everyday! Put The Cow at the top of your list for all your gift-giving needs. 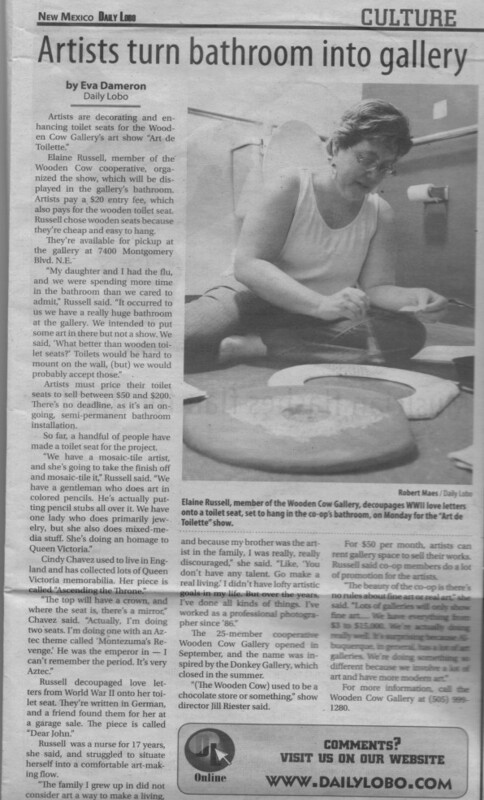 Elaine Russell, member of the Wooden Cow cooperative, organized the show, which will be displayed in the gallery’s bathroom. Artists pay a $20 entry fee, which also pays for the wooden toilet seat. Russell chose wooden seats because they’re cheap and easy to hang. They’re available for pickup at the gallery at 7400 Montgomery Blvd. N.E. Artists must price their toilet seats to sell between $50 and $200. There’s no deadline, as it’s an ongoing, semi-permanent bathroom installation. So far, a handful of people have made a toilet seat for the project. Russell was a nurse for 17 years, she said, and struggled to situate herself into a comfortable art-making flow. The 25-member cooperative Wooden Cow Gallery opened in September, and the name was inspired by the Donkey Gallery, which closed in the summer. “(The Wooden Cow) used to be a chocolate store or something,” show director Jill Riester said. For $50 per month, artists can rent gallery space to sell their works. Russell said co-op members do a lot of promotion for the artists. For more information, call the Wooden Cow Gallery at (505) 999-1280. To read the original article, and to support The Daily Lobo, visit the article on their website, here. What’s in the Box? Show – Coming up Soon! Show features a wide assortment of arts & crafts that are ideal for gift-giving, including work done as an exploration of the show’s theme, including work by in-house and local guest artists. Enter to win the $500 Mystery Box Drawing (filled with arts, crafts, and treats!). Tickets may be acquired for the drawing on the night of the show, or prior to the show with any purchase over $50.00. Live Bollywood and Asian Fusion dancing by Scheherazade Dance Productions. Tarot readings by Wendy Bodin. Refreshments. Easy parking. Come on down and get some holiday shopping in! 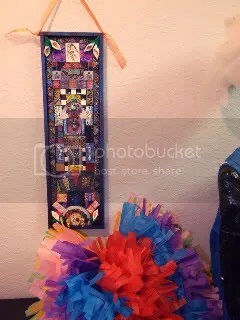 Original polymer clay mosaic, in honor of Dia De Los Muertos, by Regina Portscheller. Semi-Permanent Show Installation, hosted by The Wooden Cow Gallery and Art Space. The Wooden Cow Gallery and Art Space would like to invite you to take part in a wild, wacky, engaging art installation that’s guaranteed to raise eyebrows (and toilet seats) everywhere. Break artistic conventions. Challenge yourself. Be part of something that everyone’s talking about… Join in on our special “Art de Toilette” show; a semi-permanent installation inside The Wooden Cow Gallery and Art Space’s spacious restroom (really!). • Open to New Mexico residents only. Open to all media. Any theme or subject matter—does not have to be bathroom-related. • Ongoing, semi-permanent art installation will be on display in our spacious restroom and will be sure to generate a buzz. • Artists may submit one toilet seat per entry form. You may submit as many toilet seats as you wish, by completing a separate entry form for each entry. • Artists turning in a finished entry form and payment will receive a blank white toilet seat set to use as a canvas. We ask that you use the toilet seats we provide for this run of the project, in order to apply a consistent canvas to the installation. • Artist’s statements and CVs may be included with submission. • A nonrefundable $20 entry fee must be included with each entry form. This also includes your blank toilet seat set. We accept checks, cash, credit cards. • Accepted artwork will be displayed at the Gallery in an ongoing installation, inside the large restroom. Be part of something wild! • All work must be for sale. All work must be priced between $50 – $200 per seat entry. You cannot price your finished seat below $50 or above $200, in order to maintain consistency within the installation. • Customers will be able to purchase your entry in the gallery, at the price you set (based on the guidelines above). • A commission of 25% will be taken on all works sold as a result of this exhibition. Payment will be mailed to the artist within 30 days of the exhibition closing. Artists are required to sign a Consignment Agreement when they drop off work. • All artwork must be ready to hang or install when delivered – defined as having a wire of appropriate composition and weight attached by a set of d-rings or eye-screws on the back of the work. The artist must indicate if a piece is not meant to be hung (i.e., freestanding sculpture). • By submitting artwork, the artist agrees that images of selected artwork can be used to promote the show including publicity, ads, and web site promotions. Copyright credit will be given to the artist. Submission of entry constitutes agreement to all conditions in this Call for Artists and the attached Entry Form. • All artwork must be picked up if The Gallery ever closes the installation. • You may use any medium, technique, or material to decorate your seat. Feel free to paint, carve, decoupage, or decorate your blank canvas. We encourage you to think of ways to use photography, clay, paper, paint, ink, spray paint, resin—and anything else your creative mind can come up with. All we ask is that you use the toilet seat we provide, so everyone starts with the same blank slate. • Artists of any age may enter the contest, however those under the age of 18 require permission and signature from a parent or guardian. It should also be noted that since our contest has no restrictions on content, parents should be aware that their children’s work may be displayed alongside work with potentially mature themes. To receive an official entry form, or to contact us for more information about how to join in on the fun–contact us at thewoodencow@gmail.com, through this ad, or through the Show Director at joliedesigns@msn.com. Applications and blank canvases (seats) will be available at the gallery, at 7400 Montgomery Blvd NE, Suite 20, in Albuquerque, NM, in the Mossman Center (The Wooden Cow Gallery and Art Space). Call for Artists – What’s in the Box themed show! Contact us through this post to get an official entry form! Some details are below, to whet your creative appetite. Enter up to three pieces! Arts & crafts welcome. You’ve all heard the cliché to think “outside the box.” The Wooden Cow Gallery and Art Space would like to invite you to think inside the box for a change. Send us your interpretation of the box in all its forms, from real 3-dimensional boxes to boxing-in, enclosure, gifts, squares, cubes, etc. • Open to New Mexico residents only. Open to all media. • Deadline for submission is November 24, 2008. • Artists may submit up to three (3) pieces of art that explore the theme of What’s In the Box? The Gallery may or may not accept all three pieces, for reasons of size limitations or jurying. • Digital images of actual artwork to be juried may be e-mailed to joliedesigns@msn.com no later than November 24, 2008. Images should be in JPEG format, no more than 500 kb each. Artists may also deliver (or mail to the address above) a CD with digital images or hard copy photographs to the Gallery. CDs must contain the artist’s name on both the CD and the case. Photographs must be labeled with artists’ name. Please note that CDs and photographs will not be returned. • A nonrefundable $15 jury fee must be included with each entry form. Please make checks payable to The Wooden Cow Gallery and Art Space. If you would like to pay by credit card, please visit the Gallery during business hours (Tuesday through Saturday, 10 am to 6 pm). Work will not be considered for this show unless the jury fee has been paid. • Artists will be notified, via the e-mail or telephone number provided on this entry form,no later than November 26 if their work has been accepted. Accepted artwork must be delivered to the Gallery on November 26, November 28, or November 29 during regular business hours. • Accepted artwork will be displayed at the Gallery from December 2-27, 2008. • All work must be for sale. A commission of 25% will be taken on all works sold as a result of this exhibition. Payment will be mailed to the artist within 30 days of the exhibition closing. Artists are required to sign a Loan Agreement if accepted. • All artwork must be ready to hang or install when delivered – defined as having a wire of appropriate composition and weight attached by a set of d-rings or eye-screws on the back of the work. The artist must indicate if a piece is not meant to be hung (freestanding sculpture). Artwork will be juried by founding members of The Wooden Cow Gallery and Art Space. • By submitting artwork, the artist agrees that images of selected artwork can be used to promote the show including publicity, ads, and web site promotions. Copyright credit will be given to the artist. Submission of entry constitutes agreement to all conditions in this Call for Artists and the Entry Form. • All artwork must be picked up from the Gallery by December 28, unless prior arrangements are made. Entries must be received no later than November 24, 2008. A jury fee of $15 must accompany an entry form. Checks, payable to The Wooden Cow, should be mailed to the Gallery at 7400 Montgomery Blvd NE, Suite 20; Albuquerque, NM 87109. If you would like to pay by credit card, please stop by the Gallery or call (999-1280) during regular business hours (Tuesday through Saturday, 10 am to 6 pm). Please send an e-mail to Jill Riester, Show Director,at joliedesigns@msn.com, to receive an official entry form. Dia De Los Muertos Show – TONIGHT!!!!!!!!!! Day of the Dead Show THIS FRIDAY! Come on down!